The Indian Spring – Basant Ritu – is upon us from the 23rd of March, and the flowers are in full bloom. Another winter – Shishir Ritu – has been wistfully bid adieu as we gird up for the onslaught of heat – Grishm Ritu – from May end. The good news is our mustard crop was 800 kilograms on 1 acre, which is as at par with the yield from a chemical farm. We will extract 250 kg of golden mustard oil, and the left over 500 kg of oil cake will go towards feeding our cows and reducing what we buy from outside the farm. Sustainability and self-sufficiency comes a step closer. And we will not have poisoned the soil, or ourselves or friends who will consume this oil, with chemical pesticides or fertilizers. The Sarson (mustard) crop lies in the shade to dry before it goes to the sole remaining village Kohlu in our vicinity which yet extracts the oil from the seed given to it – not oil in exchange of dropping off the seed. 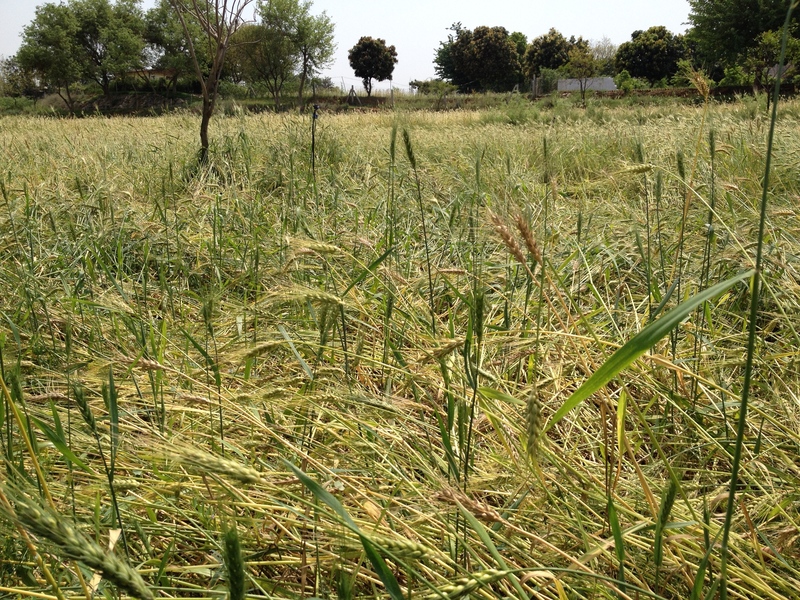 The Masoor crop has been cut and lies drying on the terrace, and the Jau (Barley) plants wait in the field for the thresher. The Wheat crop is ripened to be cut any day now, the green field of a couple of weeks back heavy with golden grain of our desi MP seed, and the Chana is ready too. 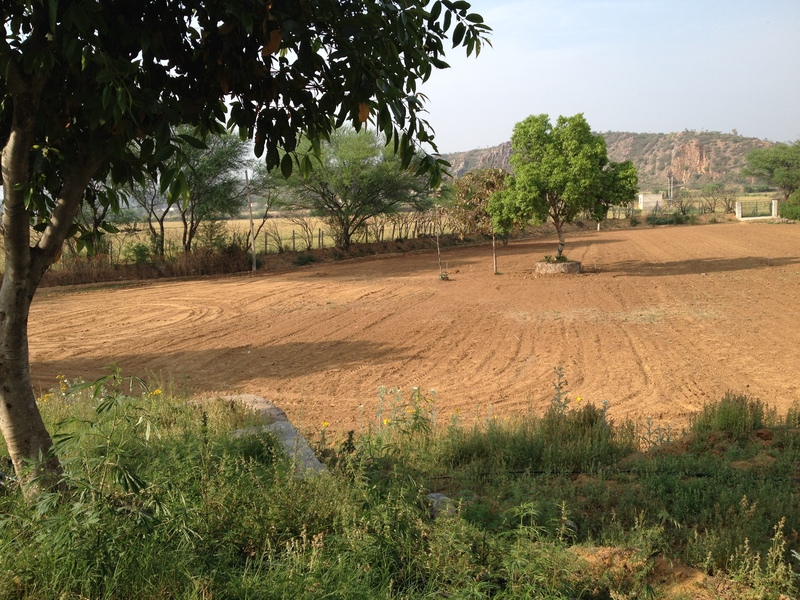 It’s all suddenly done, and nature is eager to move all of us at Aman Bagh to the next cycle of sowing. Periods of crazy activity interspersed with lots of inactivity. It’s the contradiction that teaches me to be always on alert. I hope to have similar results from the wheat crop – will we match the Punjab / Haryana output of 1,800+ kg / acre? The systemic benefits of our farm are way more than a chemical farm – healthier crops and healthy soil without chemicals, recycling cow dung as manure and using the methane for cooking, more employment (as we don’t use a tractor and as have bullocks) plus lower diesel use. But the agricultural system measures produce per acre is the only critical output factor – and we beat or meet that in Mustard. It can be done, but the system is convinced we organic types are theoretical. 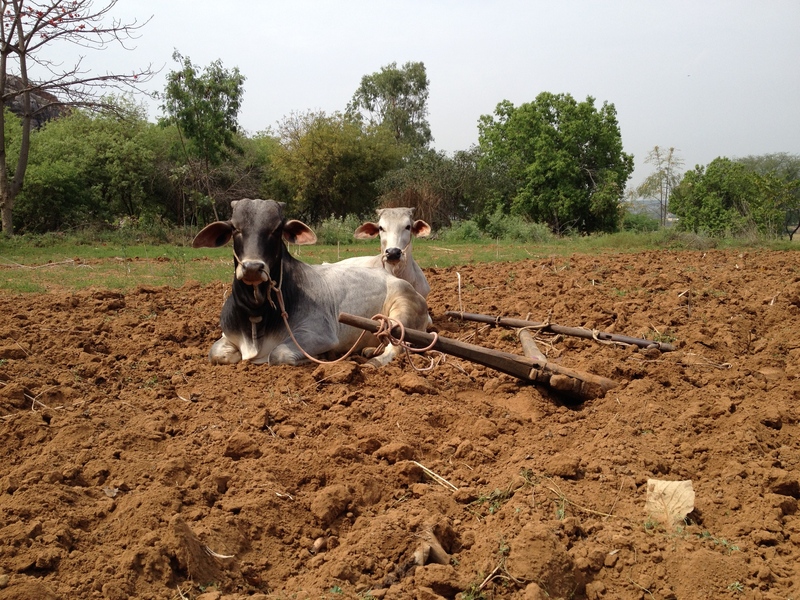 These two have had a good time of doing nothing for the last 4 months other than eating and resting, so they were naturally surprised and disgruntled when Momi yoked them 2 weeks back and got them to plough the land for the Jowar. Sorry buddies, all have to earn their livelihood. Today was hot in the sun for these two who did most of the heavy lifting, and I ended up spending most of my time out on the fields. 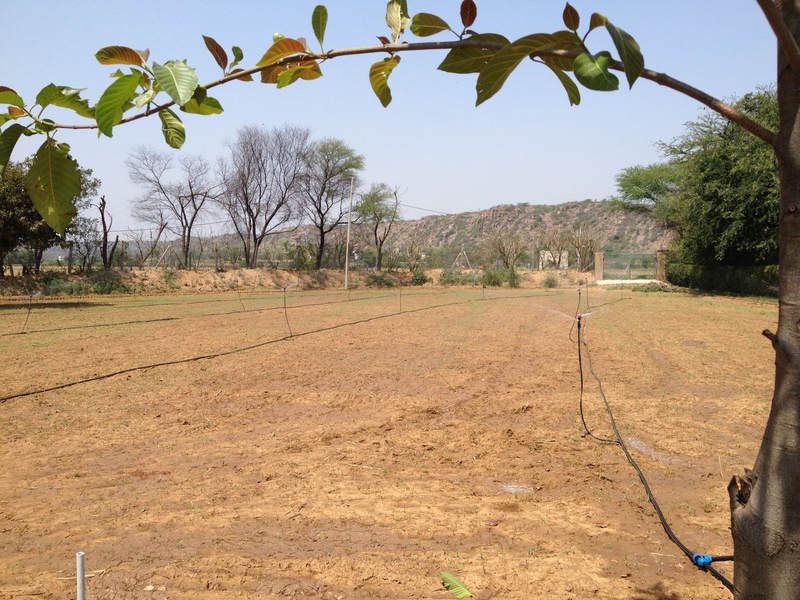 We seeded our Moong crop in one plot – we have many natural plots on our undulating land, on many levels – and will seed the Lobhia (Chaulia) dal crop tomorrow. The Jowar (Sorghum) was planted on 14 March on over 1 acre as cattle fodder, it will last us till November. The cows love this green food. Next will be Urad dal, and then Bhutta (maize), Arhar dal and Moongphali (peanut) after the wheat is cut. It sounds confusing and more complex than it is, really – you get into the rhythm within a couple of seasons. I ploughed the land today with our two bullocks, for the first time on my own, with my Ph D mentor watching from a distance. The plough wobbled with a life of its own in my hand – I tried to hold it down into the earth with a firm wrist as the bullocks made their way forward; attempted to plough a straight furrow and ‘tik tik‘ ed Shamsher on the left and ‘aah aah’ ed Dalsher on the right; while trying to keep the sharp end of the plough away from the legs of the bullocks – and me. Sattar informed me with complete seriousness that should I happen to cut into their legs, I should immediately piddle on the cut – woman around or not, I should forget niceties and drop my pants to aim at the cut. He swore it is a master cure, and I wondered if it would work if I cut myself. Driving a pair of bulls is kind of like driving a car, except that the bull power is alive with a mind of its own – especially as they spy green fodder on the side and stop to bite it off without any reference to my entreaties and threats to move. Maybe I will get a hang of it in a couple of years. Sattar took over and smartly moved the bullocks at a pace twice that of mine, straightening out my nervous furrows with a deft hand. It rained small balls of ice for 20 minutes last week, and as it hit our wheat crop it flattened almost all the golden stalks to the ground as well as broke numerous stems. I expect the crop to be affected – maybe 10% – as the final 10 days of ripening have been reduced for most of the crop. Farmers in our area in Faridabad were lucky, not so those in Maharashtra where hail devastated entire crops and peasants in debt have committed suicide. I am continually humbled by the realization that my hobby is a question of survival for most Indian farmers. 80% of land owning peasants own less than the 6 acres Isky and I own. Another season, another series of crops reaped, the next seasons sown – enabling me learn more of the ways of peasant life, from the peasants themselves. Close to nature, to animals, and to some of the most wonderful men and women from the village; in addition doing what I enjoy – sweat-of-my-brow hard work, discipline, executing to a plan, measuring its success, and continually improving. This entry was posted in A Day in The Life, Bullocks, Crops, Rural Village Life. Bookmark the permalink.